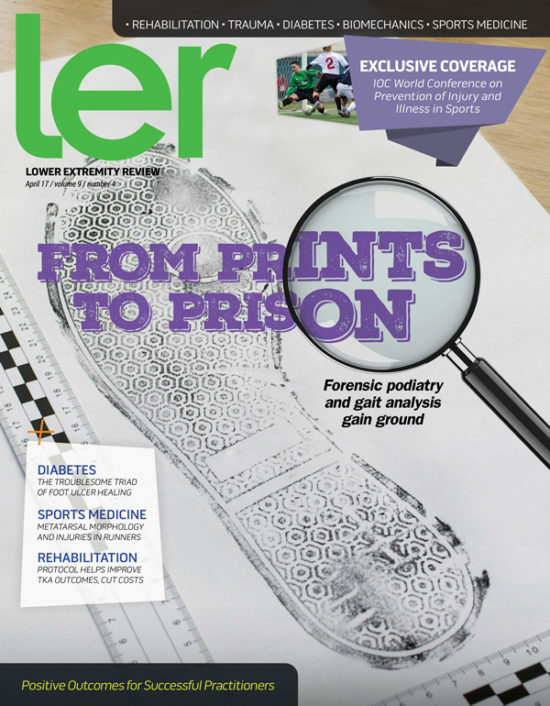 Increasingly, lower extremity experts are being called on to assist with crime scene investigations by analyzing footprints, shoe prints, and the gait patterns of shadowy figures on security videos. For members of this fledgling field, as Sherlock Holmes famously said, the game is afoot. A recent study reported that National Football League (NFL) running backs with more than 300 carries in a season are not more likely to miss time with an injury the following season than those with consider­ably fewer carries. For fantasy football players, this is great news. But for sports medicine experts, it’s a reminder that injury risk rarely can be boiled down to a single parameter. Athletes in all sports—from gymnastics to volleyball to running—struggle with injuries, and that means injury prevention is top of mind for the global community of sports medicine researchers and clinicians. In March, those experts convened in Monaco at the IOC World Conference on Prevention of Injury and Illness in Sport to develop strategies for taking sports injury prevention to the next level. LER ’s exclusive coverage of this event focuses on lower extremity injuries, from ankle sprains to hamstring strains. A multidisciplinary joint replacement program is improving patient outcomes, decreasing complications, and shortening hospital stays, which helps to lessen clinical anguish following total knee arthroplasty as well as the financial burden on patients and the healthcare system. Although it has not been shown to be a risk factor for stress fracture in traditional running, the presence of Morton’s foot (a second metatarsal longer than the first) alters running mechanics in ways that may exacerbate the risks of forefoot injury associated with alternative running styles. Uncontrolled deformity, deep infection, and ischemia-hypoxia make up the troublesome triad of confounders associated with healing challenges in patients with diabetic foot ulcers. Clinical examination and intervention in nonhealing patients should focus on these three elements. Patient-specific implant wear rates following total hip arthroplasty (THA) are more strongly associated with gait patterns than component positioning, according to research from Chicago that suggests implant wear could be reduced with the use of predictive wear models. A custom-molded silicone toe separator can help reduce hallux valgus angle and pain in patients with hallux valgus, according to research from Thailand. Fourteen weeks of mechanical loading is associated with Achilles tendon adaptations in senior women, according to German findings suggesting older age should not exclude patients from exercise-based Achilles rehabilitation. The Owings Mills, MD-based Board of Certification/Accreditation (BOC) in March announced its receipt of awards in two categories at the 11th annual Stevie Awards gala, held February 24 in Las Vegas by the Fairfax, VA-based Stevie Awards group. Peachtree City, GA-based Sigvaris in March celebrated the grand opening of its expansion for its North American headquarters with a ribbon cutting ceremony that included local city officials, employees, and members of the company’s founding family. Rockaway, NJ-based Allard USA announced in late March that its new website, allardafo.com, is live. The site features the history of its ToeOff ankle foot orthosis, a “40 Reasons” section detailing the company’s process from manufacturing to social responsibility, and links to Allard suppliers worldwide. San Diego-based DJO Global in March launched the OA Reaction TriFit Knee brace from DonJoy, the company’s latest osteoarthritis (OA) knee brace designed to provide pain relief to those with moderate to severe knee OA. Matthews, NC-based Paceline in late March acquired Orlando, FL-based Orthomerica’s Seal PVA business. The Washington, DC-based American Orthotic & Prosthetic Association (AOPA) announced in March that the American Board for Certification in Orthotics, Prosthetics & Pedorthics (ABC) will sponsor the 2017 AOPA World Congress Presidential Papers, the top 10 clinical education submissions to the congress of original research backed by a full manuscript. Austin, TX-based Ottobock HealthCare in March acquired prosthetic foot and ankle maker BionX Medical Technologies, headquartered in Boston, MA. Kappa Delta Sorority and the Orthopaedic Research and Education Foundation (OREF) in March at the 2017 Annual Meeting of the American Academy of Orthopaedic Surgeons (AAOS) presented four awards of $20,000 each to scientists for conducting outstanding musculoskeletal research. The meeting took place March 14-18 in San Diego. Investigators from the Hospital for Special Surgery (HSS) on March 14 presented research at the 2017 Annual Meeting of the American Academy of Orthopaedic Surgeons (AAOS) in San Diego that confirms a seven-question survey developed at the Manhattan-based center is a valid and efficient tool for assessing patient outcomes following revision total knee replacement. Orchard Park, NY-based Curbell Plastics in March provided technical expertise and donated material to students in the Technology and Engineering (STEM) Program at Wilson High School in West Lawn, PA. The Journal of Experimental Orthopaedics on March 31 published a study of Foothill Ranch, CA-based Össur’s Rebound PCL (posterior cruciate ligament) brace, showing the device significantly reduced peak patello­femoral joint (PFJ) pressures in in PCL-deficient knees compared with no brace. Boston, MA-based Tekscan on April 28 introduced the worldwide release of its Strideway gait analysis system. The modular pressure mea­surement system provides kinetic, temporal, and spatial gait parameters, as well pressure and force data. Injinji now offers the Ultra Compression Toesock specifically designed for athletes. The patented five-toe socks combine a seamless, lightweight design with compression technology to increase comfort and reduce athletes’ recovery time. Described as an add-on treatment, Baby Foot is an exfoliating foot peel designed to leave cracked, painful feet feeling soft, supple, and renewed. Baby Foot is powered by 17 natural extracts and glycolic and lactic acids, which gently remove dead skin. Reset Sport Kinesiology Taping Socks are designed to facilitate recovery from foot and ankle injuries and aid in their prevention. By simulating a proprioceptive neuromuscular strap, the socks provide external support without restricting normal range of motion. The Sigvaris Midtown Microfiber compression collection for men now includes navy socks in two compression levels, 15-20 mm Hg and 20-30 mm Hg. The compression socks are designed to be comfortable and durable while providing therapeutic relief. Astro Medical introduces the Astro XO flexible exoskeleton designed to rehabilitate ankle power and forward propulsion to treat soft tissue and joint disorders (such as plantar fasciitis and Achilles tendinitis) that affect gait.